This entry was posted in Environment and tagged google, grid parity, solar energy. Bookmark the permalink. They’re already operating on a 100% renewable resource: brand & trademark searches, which have become the way most internet users navigate to sites they already know. Google and John Aziz remain leaders in exploring new ideas! Let’s keep a couple of facts in mind as technologies and human follies unfold. Additional evidence and expert testimony continue to debunk anthropogenic global warming, now hiding behind euphemisms “clean energy” and “climate change”. My limited understanding confirms John’s assertion that storage is the major obstacle to growth of renewable energy. There is little or no news on storage technology research and development — by industry, government sponsored, or even Obama’s crony-capitalists. Google is its own cartel. It controls an enormous amount of economic value without producing any of its own. They are like an information bank, another parasite feeding at the human animal. If they go 100% green, then they do it because they feel they will profit by it, not for any moral reason. I would love to have solar panels put on my roof. But the problem with solar panels on the roof is that they make roof repair almost impossible. In case there is leak or something. 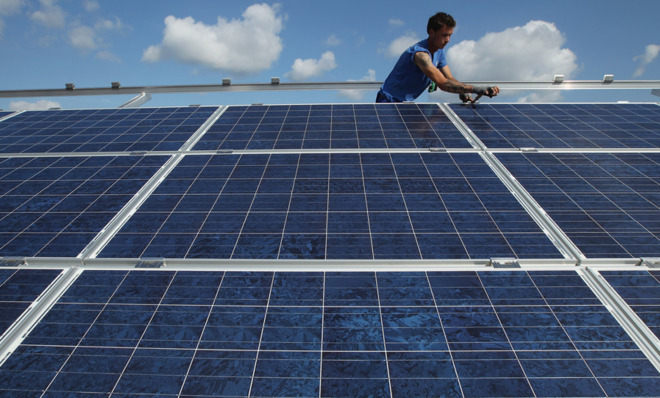 Solar panels may be cheap but maintenance cost your fortune.